A few years ago director Hu Guan made a big splash in Vancouver when his blockbuster comedy Cow played to full houses that did nothing but laugh. It was a movie that played well to a wide audience, I certainly laughed along at most of the movie, but which appeared to work even more successfully for Chinese audiences and when it was announced that the director's follow-up would be playing the festival, I prepared myself for the same type of hilarity that made his debut such a success. Sadly, Design of Death doesn't have the same charm. Chinese star Huang Bo stars as Niu Jieshi, a clownish man who spends his time causing trouble and pulling pranks on the inhabitants of a small town which is well known for having town elders who live well past 100 years. Or at least he used to be the town jester because Niu Jieshi is dead. When rumour spreads that he died from an infectious disease, a doctor is sent to investigate. Upon his arrival Yi Sheng (Simon Yam) examines the dead body and beings to research the events surrounding Niu Jieshi's death and in the process discovers that nearly everyone in town had some reason for wanting the man dead and as the movie progresses we see Niu Jieshi in flashback action as he steals, lies, cheats, rapes and generally causes a ruckus around town. 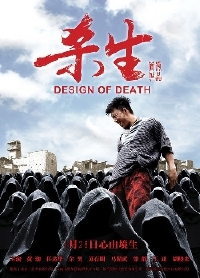 There are moments throughout Design of Death that drum up laughs but for the most part, Guan's movie comes across as a confusing mix of stories about the town jester, a guy who simply didn't know any better and who eventually realizes that there is more to life than playing jokes. In the end, he offers up the ultimate sacrifice, his life for that of someone he loves, but it's not enough for the town to either like or take any pity on the guy and quite frankly, his change of heart did little to make me like him any more than the townspeople did. Most of the jokes in Design of Death are so buried in Chinese culture that they don't translate well for international audiences. Sure the physical comedy is funny in any language but there isn't much of that on display here and further, one needs context in order to feel satisfied and Design of Death doesn't provide enough context for international audiences to really enjoy this bit of satire. Design of Death is best left to audiences who can understand and appreciate the culture.